2013 was a warm and dry vintage at the Whalebone Vineyard in Wrattonbully. The 39 year old vines received 40% of average growing season rain at Whalebone Vineyard for vintage 2013. The heat summation for the 2013 growing season at Whalebone was 1602°C days compared to the average for the past 10 years at 1449°C days. Despite being one of the warmest growing seasons on record at Whalebone Vineyard, the Cabernet Sauvignon grapes were harvested at the normal time on the fifth of April at 24 Brix sugar and with perfectly mature tannins, colour and flavours. Much of the above average heat was attributed to elevated night temperatures and days were moderate with few days above 35°C and no extended heat waves. The hand selected bunches of Cabernet Sauvignon from Whalebone Vineyard and the Shiraz from the neighbouring Crayeres Vineyard were separately de-stemmed, partially crushed and chilled to 2°C into tubs each containing 0.9 tonnes. The maximum temperature reached at the peak of fermentation was 34°C and after the completion of fermentation the tubs were sealed down for a 7-day post fermentation maceration. The tubs of Cabernet Sauvignon and Shiraz were separately tipped into a small airbag press and pressed straight to French oak barriques, 90% 0f which were new and the balance 1 use. In January 2015 the wines were clear racked from barrique and 85% Cabernet Sauvignon and 15% Shiraz were blended ready for bottling on 17th of February 2015. 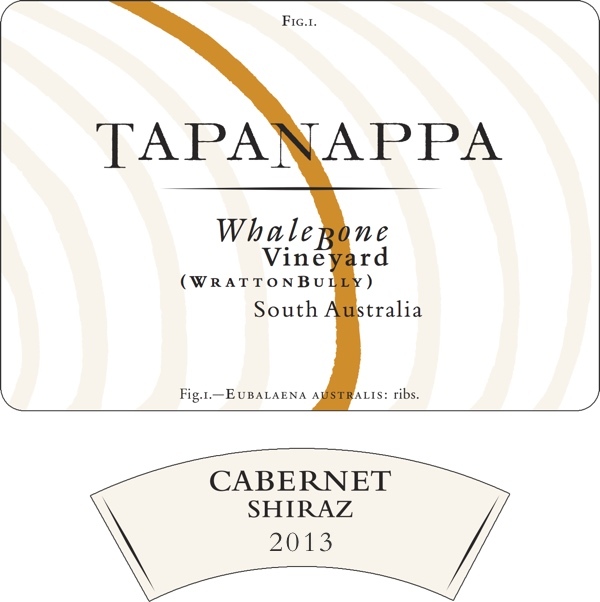 Tapanappa 2012 Cabernet Shiraz is a big ripe wine reflecting the warm and warm, dry 2013 vintage. The colour is medium density and purple edged, the aroma is of cedar and spicy cassis Cabernet and the earthy terroir character of the Whalebone Vineyard. The Shiraz plays a role in filling out the middle palate. The core of the wine is sweet but the finish is of gentle savoury tannin. Bottled in February 2015. Only 500 dozen grown and made.